One of the most exotic of all birds is captured in this wonderful tapestry called “Dino”. “Dino” depicts a highly stylized blue and gold Macaw sitting on a branch. Magnificently colored and highly intelligent, these birds are found in tropical South America from Panama to Paraguay. They can live up to 60 years and are one owner animals and fiercely loyal. A full-grown Macaw is the largest of all parrots. 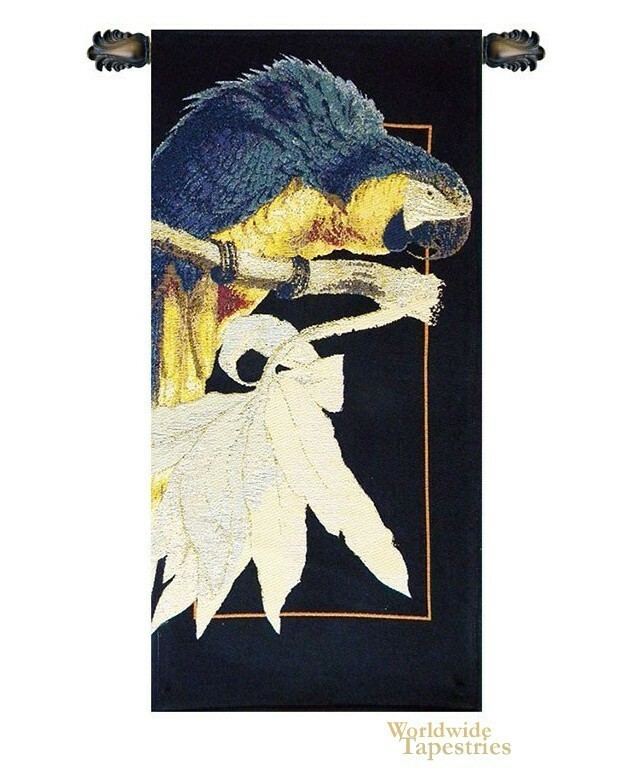 This tapestry captures the richly colored plumage, jet black beak and butterscotch under bellies in all their splendor. The delightful Macaw is brilliantly depicted here. This tapestry is lined and has a tunnel for easy hanging. Note: tapestry rod and tassels, where pictured, are not included in the price. Dimensions: W 14" x H 26"